After having the world’s best-selling album of 2008, the band Coldplay became an international phenomenon and a prime example of savvy global marketing. Today, some are saying the band has lost its marketing mojo by giving their latest album a meaningless name that doesn’t easily translate or resonate with mainstream audiences. 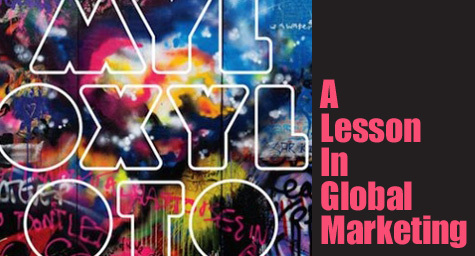 The Atlantic recently reported on how Coldplay’s troublesome title, Mylo Xyloto, is a classic case of a global brand gone wrong. According to Coldplay’s lead singer, Chris Martin, the band derived their new album’s name by simply putting a few random words together. Unfortunately, fans are unable to understand or even pronounce the title. This is a major marketing mistake for a group whose enormous success transformed them from a band into a brand. There was no consideration of how fans would relate or respond to the album’s title. There was no thought into cross-cultural dynamics, basic audience appeal, or the impact on overall sales. But Coldplay isn’t the first international brand to inadvertently tarnish its global name. When Chevrolet named its Nova model, the company didn’t consider that “nova” means “does not go” in Spanish. It also wasn’t the best idea for a Swedish baby wear company to launch a product line called Fartek. Now Coldplay is having a rude awakening as audiences struggle to pronounce the album’s title. Hopefully this will be a lesson for the band and other brands that a catchy name has become the name of the marketing game. Learn how proper messaging can position your brand for success, contact MDG Advertising today at 561-338-7797.